Shopping in Hong Kong is like shopping no place else in the world. And in the same city where you can haggle for priceless antiques and rarities, you can also hike some the wildest trails you’ve ever seen. I love the combination of it all – check out my shopping, hiking and brush with Iranian culture all in one weekend. On Friday, I introduced my friend Julie to Li Yuen Street in Central. Li Yuen was similar to Mong Kok’s Lady’s Market – it was two streets that sold extremely cheap stuff that mostly tourists (and I guess some locals) would want to buy. She’d been stocking up on souvenirs lately for the people back home (better than rushing around at the last-minute in Hong Kong, right? ), and we found some excellent, very authentically Chinese souvenirs for great prices. Take your pick: knock off bags, tchotchkys, or super-cheesy Asian souvenirs? 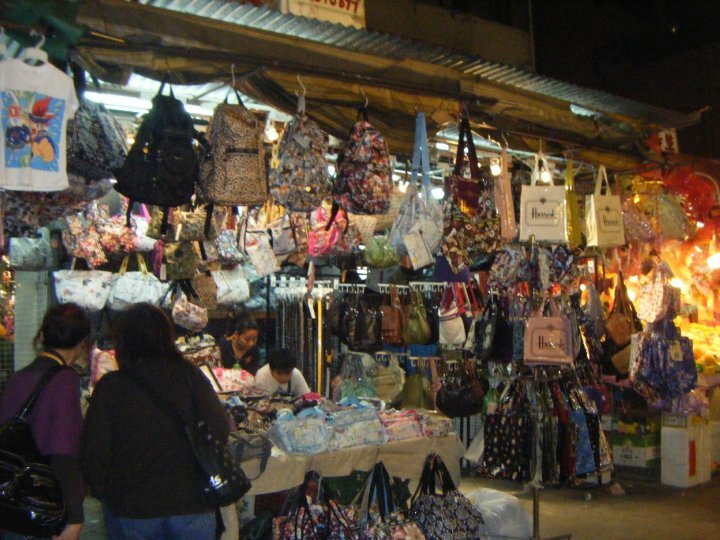 Then that night, my friend Angela invited me to go out to Temple Street Night Market, and on the way I was introduced to another shopping street called Fa Yuen Street; yet another great, touristy shopping area. And while we were there, we had to try some of the local street food (naturally) – fish and shrimp balls were my choice that night and they were delicious – no food poisoning this time thankfully! That only ever happened in mainland China. So we shopped on Fa Yuen, the Goldfish Market (since Angela had never seen it), and finally Temple Street where we had a late dinner at a little restaurant on one corner of an intersection. The weather was so nice that day that we just had to sit outside somewhere and the eggplant hot pot, stir fried Bok choy, and chicken and mushroom potted rice we all shared were delicious. If you haven’t tried braising eggplant before, I would highly recommend it – I became addicted to it over there. 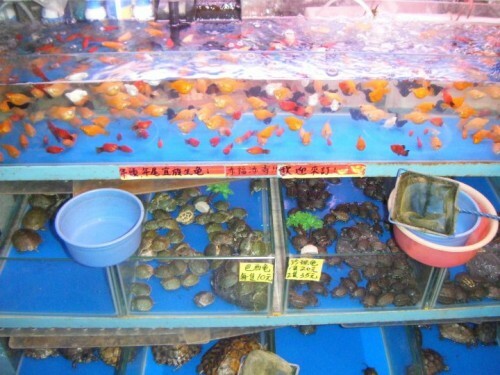 Goldfish Market. Pick a fish, any fish. Saturday was busy as well. As I mentioned, I was a member of the Exchange Activities Committee, and on Saturday we had our second event for the semester, “Oasis at the Beach.” Basically, it was a hike around Kowloon Bay up a mountain trail called Lung Ha Wan and back over to the Kowloon Beach for a barbecue afterwards. For once, we had perfect weather. There was not one cloud in the sky, the temperature was more than warm (I wished I had worn shorts instead of jeans by the end of the hike), and all but two people who bought tickets showed up that morning. 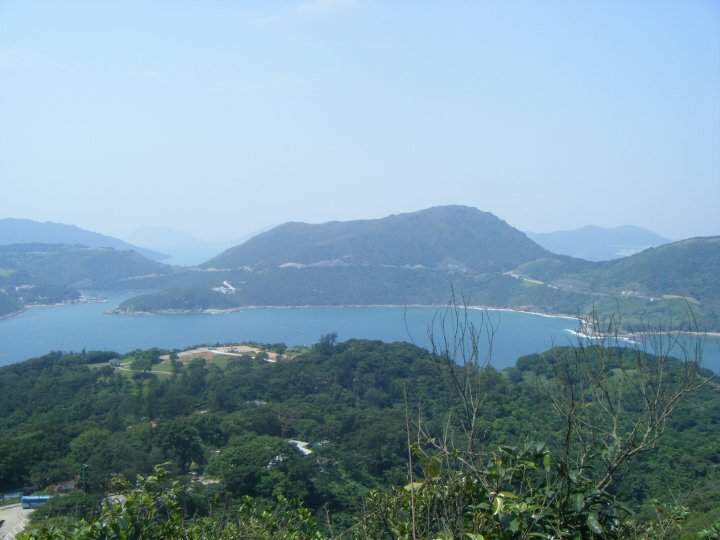 It was absolutely gorgeous once we got to the top of the hill, the view of Kowloon Bay and Hong Kong island off in the distance was amazing. So rewarding. You could see for miles! In all, it took us about three hours to do the whole hike, and by the time we reached the beach, we were definitely ready for a barbecue. Hungry was an understatement. One of the many fantastic views of Lobster Bay on our hike. Beautiful! Now this was not the “American barbecue” you might be imagining – oh no, it was a very Asian-style of barbecue. Let me explain the differences I noticed: we had fish balls, lobster balls, little sausages with cheese inside (similar to Lil’ Smokies but better – I’ll give you that one), regular-sized sausages, hot dogs (probably the most American thing there), bread (for toasting), other assorted raw meats (beef, pork, chicken), and honey. Yep. Honey. Post-hike beach barbecue. Pass the honey. In China they used honey for basting practically all meats instead of barbecue sauce. The way you did it was to roast the meat until it was almost done, slather honey (complete with a little brush in the jar lid for brushing the honey) onto the meat, cook for a couple more minutes, eat, repeat. This could also be done for bread and anything else – we ended up coating just about everything in honey just to see how it tasted in the end. Let me tell you, honey on every kind of meat is good. If you haven’t tried honey glazed pork or chicken, I highly recommend you do so at your next barbecue – trust me on this one. After everyone had stuffed themselves with barbecue and marshmallows (no s’mores though, graham crackers don’t exist in Hong Kong), the people who brought bathing suits went swimming in the ocean. Who knew this great little beach was just about 20 minutes from our university? Awesome! I didn’t bring mine, but that was ok; I knew there would be other opportunities in the future, and I didn’t need any more sun exposure than I’d already had. Unwisely, I did not adequately protect my arms from the sun with SPF 550 (if you’ve seen any of the photos of me, you can see my Irish-German heritage proudly shining through), and I paid for it later. We returned to campus tired, salty, sandy, sunburned, but really happy around 5:30 that evening. But wait! Saturday wasn’t over yet. About fifteen minutes after I got back from the beach, Ali called me to ask if I was still planning on going to his friend Mahdi’s for dinner that night – Mahdi was having a dinner party of sorts at his apartment on campus, and had invited me to come along back on Thursday night when we first met in LKF. I said ,”Sure,” hopped in the shower, and met Ali back in the Atrium at 6:30 to walk over to Mahdi’s since I’d never been to the postgraduate apartments on campus and wasn’t entirely sure how to get there. We walked over with another friend, Janet, who came along at the last minute, and I got re-acquainted with Ali’s other Iranian friends – the same ones I had dinner with the week before in Tsim Sha Tsui after hiking Tung Ping Chau (enough foreign names to keep straight, yet?). I also met Mahdi’s roommates, one was an Indian guy and the other was a New Zealander (a Kiwi), and both were also PhD students. Everyone was very friendly, and the feast of traditional Persian food Mahdi made was fantastic! I didn’t know even half of the proper names for what we had but I know that saffron, eggplant, veggie burgers, peppers, spaghetti, herbed rice, and rice with raisins and nuts were all involved. 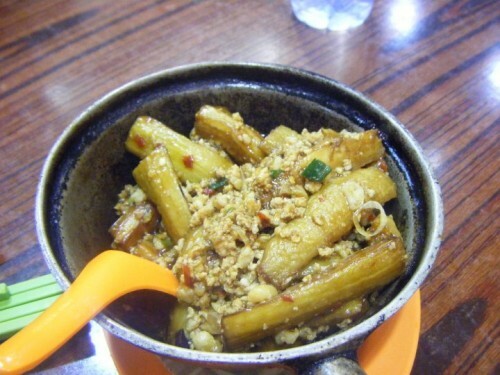 Why, why, why has the US not mastered eggplant preparation the way Asia has? It’s so great! There was Farsi flying all during dinner, but Ali and the others were kind enough to usually translate for those of us who didn’t speak it, and I really enjoyed myself. We ended up all staying and chatting after dinner and tea until about 11:30 that night about every topic imaginable – politics, music videos, the differences between our cultures, the views on the war, renewable energy, etc. It was such a good day, and I loved all the new people I got to meet that night as well; Mahdi was an excellent host. The next day, Sunday, wasn’t quite as exciting and action packed as Saturday. The majority of my friends had a lot of catching up to do; Abby’s roommate from Emory had been in town from Wednesday til Friday, so we had barely seen her on campus and she had a lot of work, Jen’s parents had been there since April 12th and Jen went away with them the weekend prior to a resort in China, and then spent most of the week with them when she wasn’t in class, and Ilaria had a group project due the previous night plus a midterm the past week and another the coming week, so I was basically on my own for the day. I met them for lunch on campus then went to explore Kowloon Bay (a big shopping area) for the afternoon. 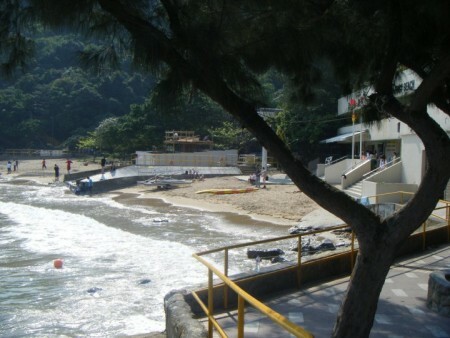 Kowloon Bay was made up of three different plazas all located right next to each other in this complex. It had all the usual suspects for shopping, too – IKEA (where I got all my room gear the very first days at school), Hallmark, Mango, Giordano, Marks and Spencer, and (you’ll never believe this) a Ruby Tuesday restaurant! I know. Of all the chain restaurants to have. I couldn’t believe it either! That is the absolute last thing I would expect in Hong Kong of all the places on Earth. It was so funny and out of place. So I killed an afternoon happily exploring there, had dinner with my other Italian friend Pietro – he had just gotten back from taking a university exam in Italy and then was delayed an entire week by the volcano eruption in Iceland, did some studying for a quiz I had on Tuesday for marketing, and did a little more research about the hostels in Taiwan. 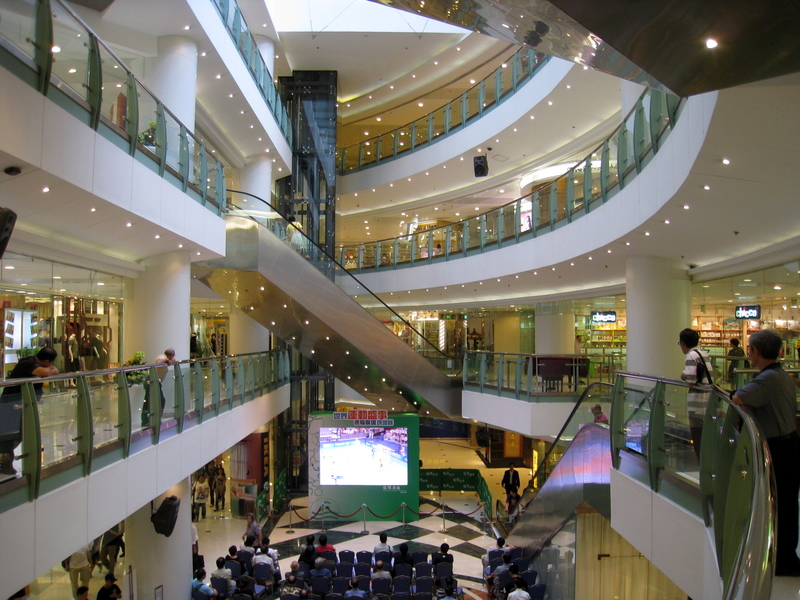 Fantastic shopping complexes. Asia knows how to sell commercialism, I’ll give it that for sure. A couple of girls and I agreed earlier that week to make one last foray out of Hong Kong before the semester was over to Taipei, Taiwan right after classes ended and before finals began. So we decided to go from May 14 to May 18 to Taiwan and we booked our flights on Tuesday night! Woo hoo! That was the best final hurrah outside of Hong Kong I could have imagined. Whew! And that is my update for the week. Yet another novel, I know. just get so caught up and there’s always so much to tell! I hope you all enjoyed it. Be sure not to miss my next post when I check some big items (literally) off of the Hong Kong bucket list! 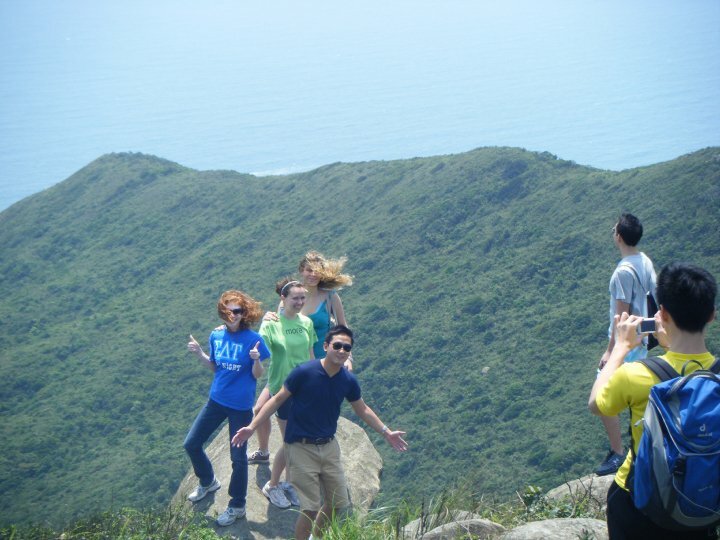 Lantau anyone? Such a cool experience on the edge of this cliff during the hike. 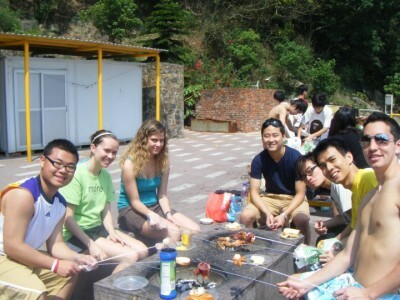 This entry was posted in Asia, Hong Kong and tagged Asia, barbecue, Beach, Hong Kong, Iran, Shopping, Travels on April 21, 2014 by Paige N.. Indeed you are my friend. Indeed you are. Hello! I am a Production Assistant from Radio Television Hong Kong (RTHK) who is working on a new TV program called <> which is a documentary with 10 episodes. For my episode, we are looking for some Iranian, Persian and Farsi as our interviewer about their daily live in Hong Kong, how they integrated into Hong Kong society. Therefore, we are wondering if you can help with our research. Looking forward to your good news. Thanks for reaching out to me. It’s been a few years, but I still have PhD friends studying at HKUST from Iran. I’ve sent them a message with your contact info and hopefully a few of them will be kind enough to reach out and do an interview for you. Best of luck and thanks for reading the blog! layout to your weblog. Is this a paid topic or did you customize it your self? Anyway stay up the nice quality writing, it’s rare to see a nice weblog like this one nowadays..